2013 Super Box Football is a premium product of repurchased cards and memorabilia. Put together by long-time hobby dealers SBay Cards, the product is like a high-end grab bag offering top autographs, memorabilia cards and rookie cards. 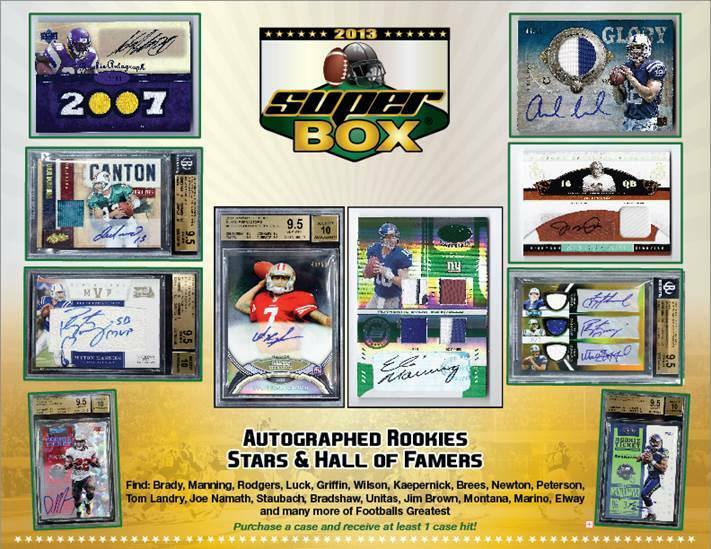 Each 2013 Super Box Football box has between one and five premium items. These include rookies, Hall of Famers and other desirable players. Current superstars like Andrew Luck, Adrian Peterson and Tom Brady are inserted alongside such all-time greats as Terry Bradshaw, Walter Payton and Brett Favre. Many cards also come graded by PSA and BGS. 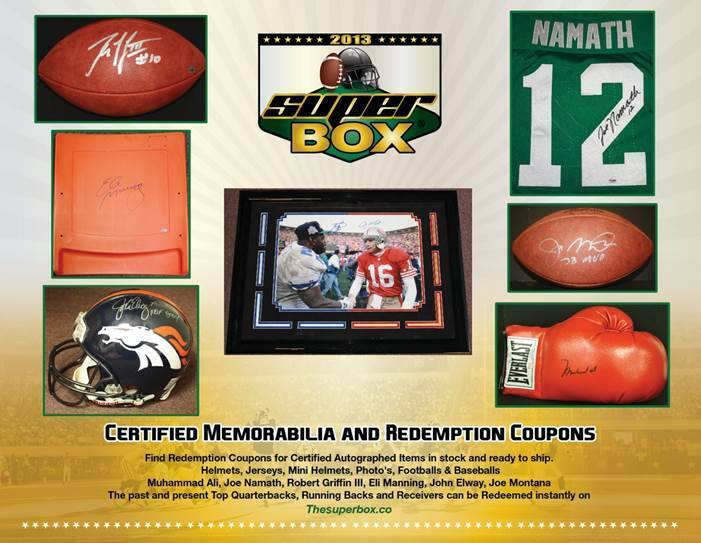 2013 Super Box Football also has randomly inserted redemptions good for full-sized pieces of autographed memorabilia. Because they're already in stock and ready to ship, collectors won't have to wait long periods of time to get their items. Signed footballs, photos, helmets, jerseys and even stadium seats are up for grabs. There's also an autographed Muhammad Ali boxing glove. Click here to learn more about 2013 Super Box Football and to order boxes for $139.95.